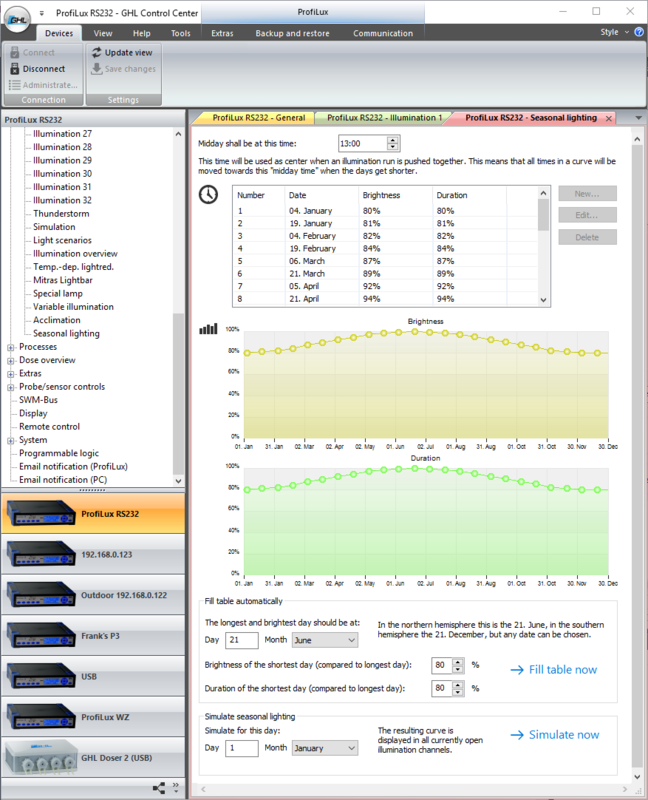 Home »KB FAQ »How do I use the Seasonal Lighting Simulation? How do I use the Seasonal Lighting Simulation? The duration of a day (defined as the time between sunrise and sunset), night and sun intensity change depending on the season. The amount of change that occurs throughout the day depends on the latitude; the farther it is from the equator, the greater the difference between the longest and the shortest day will be. Summer begins on the longest day of the year. Winter begins on the shortest day of the year. When day and night are the same length (equinox), it marks the beginning of spring or autumn. The seasons are opposite in both hemispheres. The sun intensity will also change more the further away the latitude is from the equator. The date may vary by one day depending on the year. The Seasonal Lighting Simulation automatically adjusts existing illumination curves by changing light intensities and times throughout the year. Seasonal lighting can be combined with other simulations such as thunderstorms, rainy days, moon phases, clouds, and acclimation. That means that the brightness of an illumination channel is calculated from the combination of all active simulations. First you set the curves for the longest and brightest day (summer start). 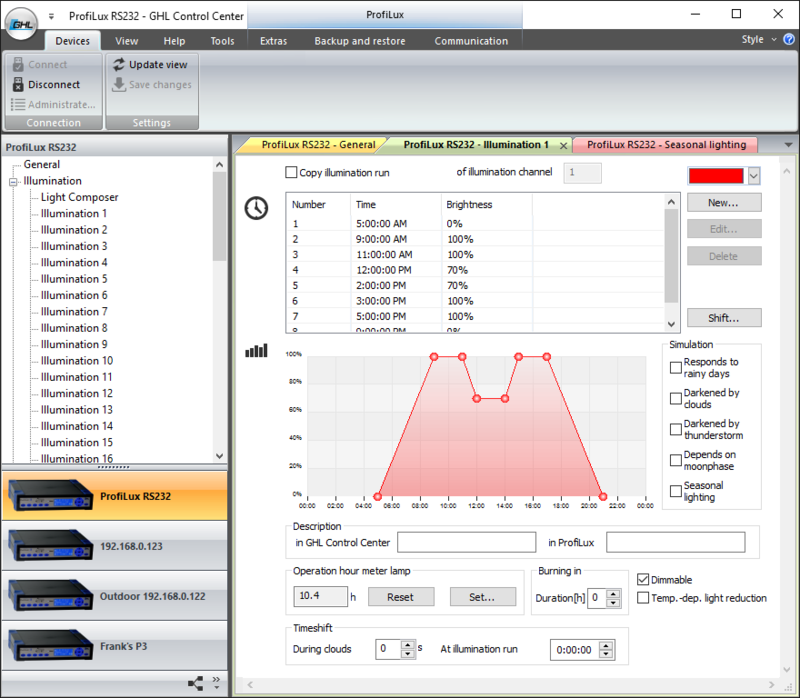 Additionally, for each channel the checkbox “Seasonal lighting” needs to be checked so that the selected illumination channels respond to the simulation. 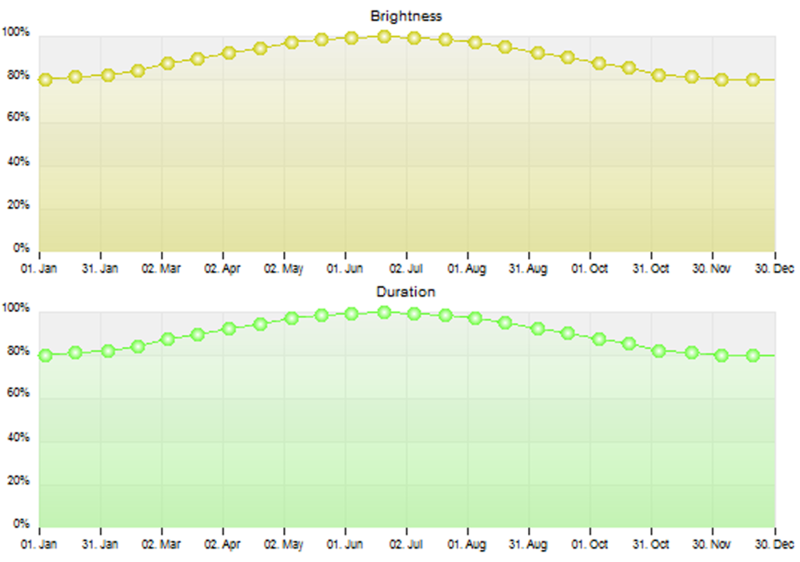 If seasonal lighting is disabled for an illumination channel, the set lighting curve will run every day unmodified. Definition of Midday: The time is taken as the center, when the assigned illumination channel(s) runs are pushed together during the year. In the example above, the center of the curve is at 1:00 PM, so here also 1:00 PM should be set as “Mid-Day”. Definition of the duration and brightness over the year: In a table, the duration and brightness can be defined for up to 24 days a year. The duration and brightness of days that fall between the defined days are calculated automatically. This allows for a smooth transition into the simulation. The illumination curves concerned are recalculated daily, this means the illumination brightness is reduced and the duration of illumination is shortened if necessary. 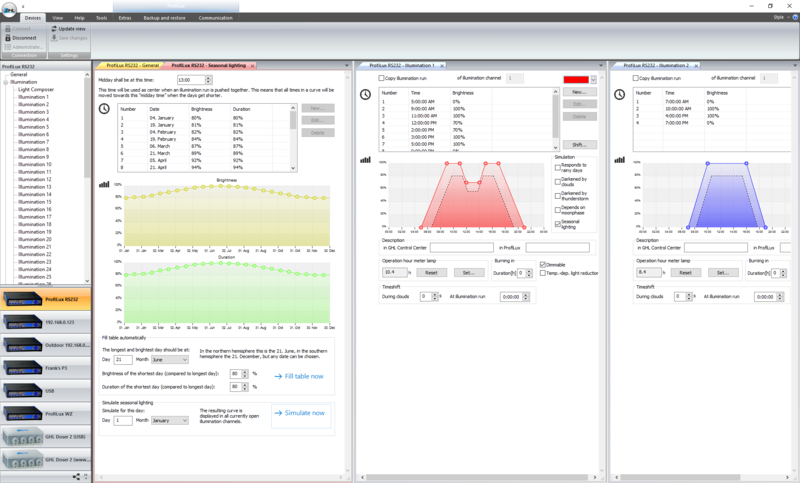 GHL Control Center offers a convenient way to automatically fill the table with the values for day, time and brightness. Click on “Fill table now”. The table will automatically create a course which very closely matches the natural conditions. After the simulation course has been programmed, you can view the resulting illumination run for each illumination channel. 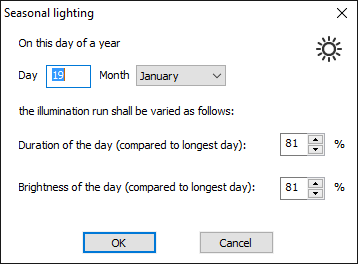 Open the illumination channels whose simulation course you want to see (tip: In GCC you can also view several windows – as Seasonal Lighting and illumination runs – next to each other, move window for this on the register tab), then select the date for which you want to simulate. After clicking on “Simulate now” the simulated runs are represented by dashed lines in the illumination channels. Please use the “Seasonal Lighting” with caution. Remember that (at large) variations of illumination duration and intensity could harm corals or plants in the aquarium and the entire system could be destabilized. ← Previous Previous post: What is the Power Balancing Technology (PBT)? Next → Next post: What is the meaning of the blink and color codes of the GHL Logo?